The holidays are all about slowing down, taking stock, and reconnecting with the people in our lives who matter the most. As part of the POPSUGAR Insights 2017 Holiday Report, we asked 3,000 US women to tell us the activities they enjoy participating in the most during the holidays. 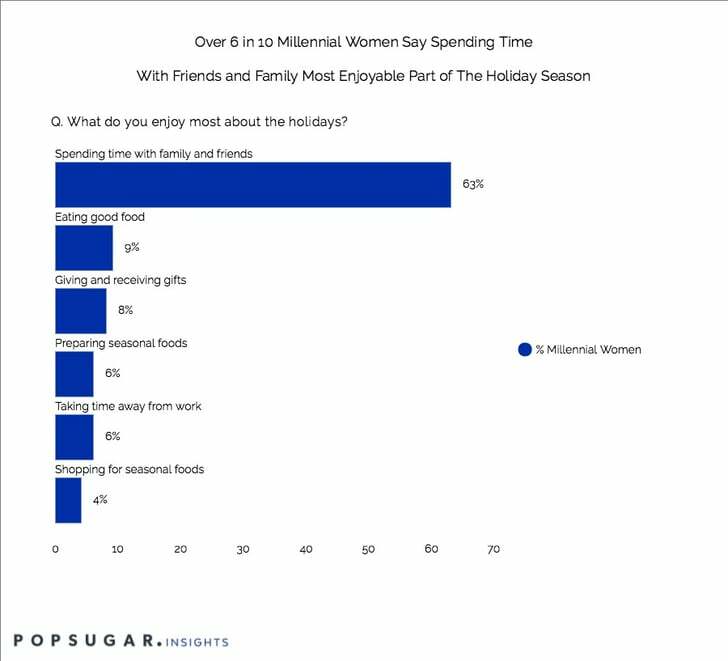 Overall, the activities millennial women enjoy most during the holidays include "spending time with friends and family" (63%), followed distantly by "eating good food" (9%) and giving and receiving gifts (8%). While the holidays can be filled with delicious indulgences, 58% of millennial women say it's "very/somewhat important" to remain healthy during the holidays. For younger millennial women, it's slightly less important (57%) than for older millennial women (60%).